This article is about the non-playable enemy characters found in Hero Mode. For the playable Octolings, see Octoling (playable). For other uses of the term Octoling, see Octoling. Octolings (Japanese: タコゾネス Takozonesu) are elite Octarian fighters and the octopus equivalent of an Inkling. They are recurring enemies in Octo Valley and Octo Canyon, appearing both in special missions where they are the only enemies, as well as in normal missions. Sanitized versions of Octolings appear in the Octo Expansion, using a much wider range of weaponry. Octolings are similar to Inklings and are the Octarian versions of them. Unlike Inklings, they have thicker and curlier hair, with four tentacles instead of six (added with their arms and legs this gives them eight "limbs", as opposed to Inklings' ten), have their suckers above their hair than underneath, beige undersides of their hair, small round ears (according to the Splatoon in-game model), purple circled eyes with a dash on the end, pointed fingers, and no spots at the ends of their hair. Like Inklings, they can walk on land in humanoid form as well as swim through their own ink in octopus form, making up a somewhat small but nonetheless dangerous portion of Octarian forces. They can use various main weapons as well as sub weapons. With no visible target, Octolings will wander alone or in small groups and ink nearby surfaces for their convenience. Upon being engaged by the player, they will make tactical maneuvers, quickly jumping in and out of their ink while shooting and throwing bombs. The best way to deal with Octolings is to catch them before they can react; once found, they are difficult to escape from, as they will follow the player in octopus form and shoot at them in humanoid form. All enemy Octolings encountered appear to be female, and their Japanese name, タコゾネス(JP) (a portmanteau of "octopus" and "Amazons"), further supports this. Their body features seem slightly more mature than the female Inklings', though this is a result of their clothing, as the in-game model is the same. These Octolings are considered elites compared to the playable Octolings, and not every female Octoling has the capacity to become a full-fledged Octoling soldier. 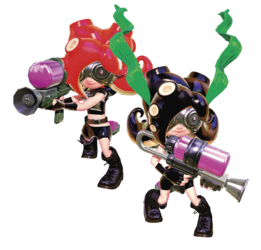 Octoling hair color seems unrelated to their ink, as they will have their pre-set hair color regardless of the color set for the mission. Like Inklings, Octolings have an octopus form, which they can use to swim or hide in ink, but can sometimes be seen using it on dry land. Compared to playable Octolings, they have a different octopus form, which has curlier tentacles of the same length and Octarian eyes. Their hairstyle is also not available to playable Octolings. While normal Octolings have red hair and are fairly easy to defeat, later missions feature Elite Octolings instead, which are faster, more resilient, and deal more damage. Further separating them from the common Octolings are their dark hair (black with a gold tinge in Splatoon, dark maroon in Splatoon 2, or a darker shade of blue in the Octo Expansion) and the two long strands of seaweed attached to their heads. In Japanese, they are called デラタコゾネス(JP) (meaning deluxe, or decorated Takozonesu). They appear in the missions Octoling Invasion, Inkvisible Avenues, Octoling Assault, Propeller Lift Fortress, Spinning Spreaders, Octoling Uprising, Spongy Observatory, and Octoling Onslaught. The only weapons they use are the Octoshot and Splat Bomb. DJ Octavio is shown to be able to assume humanoid form in Sunken Scroll 16, and is the only known enemy male Octarian shown in Splatoon. Art of an Inkling with the full Octoling set. The Octoshot Replica is given to the player by Judd at Level 40, completing the Octoling set. Renders of Octolings from Splatoon 2. In Splatoon 2, Octolings have a slightly different design of their Octosuit, wearing Octoling Shades, Neo Octoling Armor, and Neo Octoling Boots. Some Octolings have colored fingertips similar to that of Marina, and Elite Octolings haved dark maroon colored hair instead of black, but otherwise function the same as they did in Splatoon. Octolings in some stages will spawn far away from Agent 4 and Super Jump near their location to attack. Additionally, they now use weapons that resemble Carbon Roller, Blaster and Slosher. These are Octarian versions of the Hero Roller, Hero Slosher, and Hero Blaster in addition to the Octo Shot. They appear in missions Octoling Strike, Parking Garage, Octoling Assault, Propellerland, Octolings Ahoy!, and Octoling Workout. Marina of Off the Hook is an Octoling and a former member of the Octarian army who has since defected from their forces. The Octo Expansion introduces the Sanitized Octolings, using all previous weapons, as well as new mains, subs, and specials, including Octarian versions of the Herobrush, Hero Dualies, and Hero Brella. They are also able to use additonal subs including the Burst Bomb and Autobomb, and can now use specials, including the Inkjet, Tenta Missiles, Sting Ray, Ink Storm, Splat-Bomb Launcher, Ink Armor, and Splashdown. The physical coloration of the Octolings is very different from normal ones. They are shown to have pale greenish skin, dark teal colored finger tips and blue hair with neon yellow tips. While both types of characters are called "Octolings" in English material about the Expansion, the Japanese version makes a notable distinction between the player Octoling, called タコ(JP) "Octopus", and the enemy Octolings, called タコゾネス(JP) "Octopus-Amazon." When an Octoling is splatted, they will fly off in the form of a small ghost, just like Inklings. They even have their own unique octopus ghost for this. Despite having dark red and black tentacles, their ink is purple like other Octarians. The reason for this is unknown. It is possible to hack a playable Octoling into both games. In Splatoon, the game loads an otherwise unused Octoling alternate model supposed to be used by the player, so they can change the Octoling's skin tone, hair color, and see their eyes. These Octolings have purple eye markings with a dash, as opposed to the black markings of Inklings. In Splatoon 2, the Octoling model used in Octo Canyon has black markings with a dark purplish dash instead, and the hair is affected by movement, while it remained stiff in Splatoon's models. This is possible due to the fact that, on a technical level, the "Octolings" are simply modified female Inkling models with curvier bodies plus unique hair and travel-form models; all other model rigging and animations are shared. Moreover, the hack makes clear that in-game models of enemy Octolings are not intended to be playable, as their hair clips through a significant number of hats. However, the fact that they have a model specifically meant for this purpose, with unique eyes not seen at all during the single-player game, and their hair being textured and coded to function properly with the "team ink color" system despite the clipping issues, raised suspicion that it was likely that there were plans to make the Octolings playable at some point. Splatoon's Octoling models had been updated several times throughout updates. Early versions going back to 1.0.0 of Splatoon 2 also contained different player model types for Octoling girls and boys and possible hair renders. The model also shows Octolings having small, round ears instead of pointy ears that Inklings have. However, this round ear model is shared between Inklings for when they wear gear that cover their ears. This could be because Octolings’ ears were not supposed to be visible, thus using the existing model. Marina's model does not have ears, as she never is shown without her headphones. However, in a Twitter art post released from SplatoonJP, it is revealed that Marina has small, round ears similar to the enemy Octolings’ round ear model, but slightly bigger. Because of their similarity to Inklings, if an Octoling touches a Zapfish after its shield has been destroyed, the level is completed as if the player has touched it. However, due to the logistics of this, it can only be performed during Octoling Invasion by prematurely destroying the shield with an Inkzooka. Dera, a prefix of DeraTakozonesu, Japanese name of Elite Octoling, is a word of Nagoya dialect. At one point in Splatoon's development, Octolings' footwear looked very similar to the Moto Boots, with three straps on the side and pieces of metal on the end. This was briefly shown in a pre-release trailer for Octo Valley. The Octolings' "hairstyle" bears a resemblance to one commonly seen on female Majins from Dragon Ball Online. Both consist of four tentacles, with two in the front framing the face and two in the back curling up. In Splatoon 2, none of the Octoling gear is available to wear after completing the Octo Canyon story mode. This is unlike the first game, where it was acquired after defeating DJ Octavio. This is due to it being obtainable through getting Mem Cakes in the Octo Expansion. As seen in the art book, Octolings were originally going to have Inkling masks and floppy ears like a dumbo octopus. These ideas were mostly discarded, except for the curly, above-suckered hair and armor, and the rounded ears being reintroduced in Agent 8's design and the design of the playable Octolings. Concept art of Salmon Run show both Inklings and Octolings fighting together against early versions of the Salmonids, suggesting that Octolings were planned to be playable very early on. The playable female Octoling model appears to not be as curvy as the hostile Octoling model. It was revealed in a Famitsu interview with the developers that enemy Octolings are slightly older than Agent 8 and the playable Octolings, and only elite female Octolings are able to be these specific Octoling soldiers. In Octo Canyon, if more than one moving Octoling is on screen, one of them will disappear in the same way a player disappears in an online battle after disconnecting. Octoling artwork without their visor. A render of a common Octoling in Splatoon. An Octoling standing on a structure. An Inkling battling two Octolings. An Inkling battling an Octoling. Cap'n Cuttlefish warning Agent 3 about Octolings. Size comparison with an Inkling. A Elite Octoling from Splatoon. A Elite Octoling in a magazine. A Elite Octoling being introduced. An Octoling in octopus form. Another Octoling in octopus form. An Octoling's ghost after being splatted. An Octoling hacked into the game to be made playable. Here, they can be seen with clearly visible eyes and textured to look like an Inkling. Official art of an Octoling trying out clothes with an Inkling. An Octoling and Agent 3 riding on two Octarian machines. An Inkling wearing an Octosuit. Sunken Scroll 9 is about the Octolings. DJ Octavio (left) in humanoid form on Sunken Scroll 16. An Octoling with a Blaster. Octolings with a Slosher and a Roller. An Elite Octoling in Splatoon 2. Octolings guarding a Mini Zapfish. Agent 4 battling an Octoling. A common Octoling in standby. A Elite Octoling in standby. Above view of a Octoling. The back side of a common Octoling. The back side of an Elite Octoling. A close-up on a common Octoling. A close-up on a Elite Octoling. The Octoling’s octopus form in Splatoon 2. Marina, one of two members of Off the Hook. An Octoling hacked in to be playable, revealing their eyes. The transitional form a an enemy Octoling hacked in to be playable. A group of common and elite Sanitized Octolings. Sanitized Octolings’ octopus form and Agent 8’s octopus form comparison. The transitional form of a Sanitized Octoling. Marina wears the original Octoling costume from Splatoon in this picture shared in her chat room. A picture from the chat room of Marina wearing the original Octoling costume as well as the Elite Octolings' seaweed. The dialogue portrait for a Sanitized Octoling. Page 130, an unknown Octarian duo. Pages 154 & 155, Octo Showgirls behind DJ Octavio and Callie. Page 163, Concept art of the Splatoon 2 version of the Octoling. Page 183, two Octolings fighting against early versions of a Salmonid. This page was last edited on 7 April 2019, at 14:05. This page has been accessed 321,297 times.